When choosing a home, many variables are considered. Price and location typically come to mind, but a number of other factors should be considered. One aspect that is sometimes overlooked is the travel between your new home and your job. There are nearly 6 million workers aged 16 and older in the state of Illinois (5,982,174 to be exact). This includes 3,140,310 males and 2,841,864 females in the work force. With all these people commuting, it can be important to determine the difficulty of getting to your employment. You may have a desired mode of transportation, or you may have a strict time limit on how long you are willing to spend traveling to work. Regardless of your parameters, you will want to make sure that your needs are met in your new location. Utilizing census data, commuting in the state of Illinois and the City of Chicago can be examined by zip code. The most popular mode of transportation for the nearly 6 million Illinois workers is car, truck or van. Almost 82% (81.94%) of all commuters in the Prairie State utilize this means of transportation. 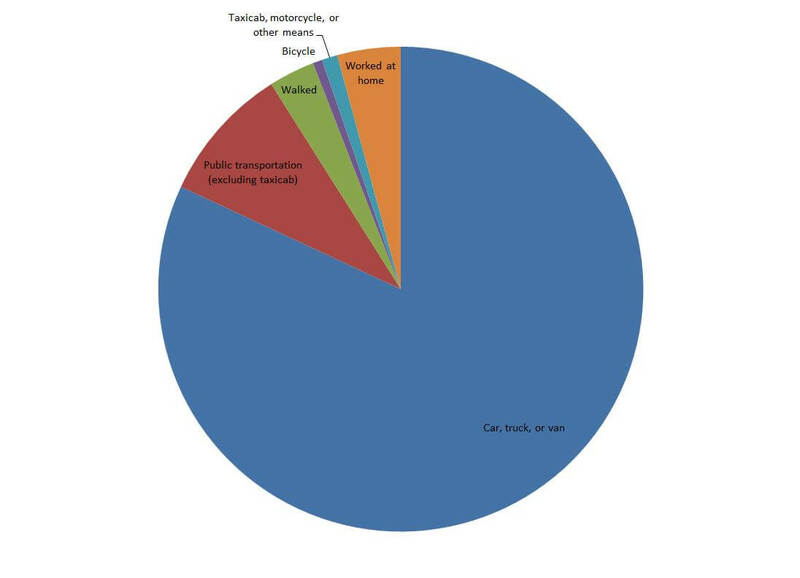 9.1% of people commute via public transportation, whether bus or train, 4.23% work from home, 3.07% walk, .041% use taxicabs, motorcycles, or another means of transportation, and only 0.62% use a bicycle to commute. This general trend held for residents in the City of Chicago as well. The majority of Chicagoans also commuted via car, truck or van. 58.25% of residents commuted this way. Public transportation was again the second most popular way to commute. A much higher percentage of Chicago commuters, 27.68%, utilized public transportation than Illinois residents overall. 6.57% walked to work. At 6.57%, the percentage of city commuters that walk as their main mode of transportation is more than twice the state average of 3.1%. 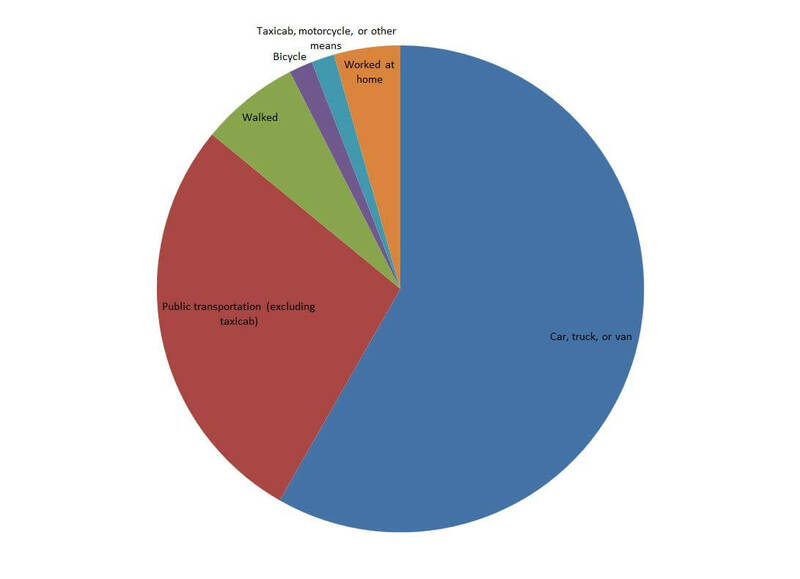 4.40% worked from home, 1.57% biked, and 1.52% used a taxicab, motorcycle, or other means. 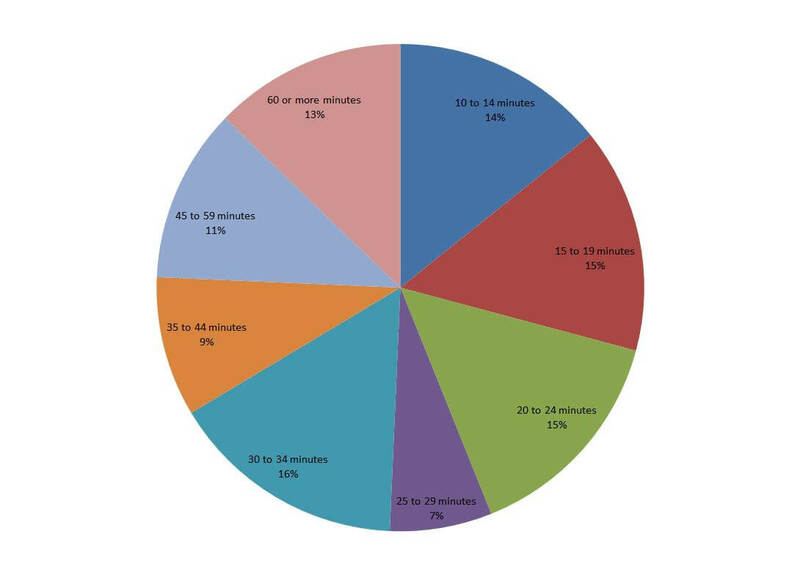 The most common commute time for Illinoisans is between 30-34 minutes. 16% of all commuters in Illinois fell into this category. 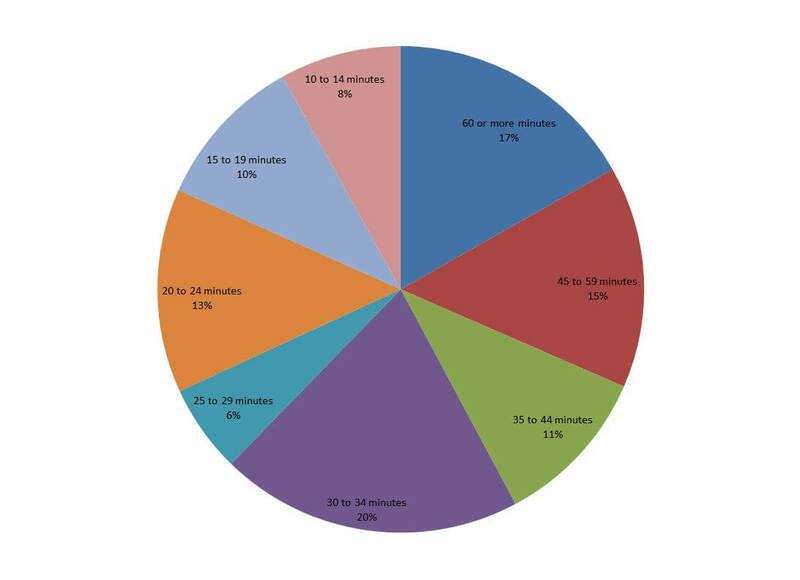 The least common commute time was 25-29 minutes. Only 7% of commuters had a commute in this time range. 14% of Illinois commuters were lucky enough to enjoy a commute of less than 10 minutes. 13% of commuters faced 60 minutes or more in commuting. The average commute times in Illinois show a large variation as well. The Barnhill, IL zip code of 62809 enjoys the lowest mean commute time at just 9.3 minutes, whereas the residents of New Memphis, IL in zip code 62266 have a mean commute of 59.9 minutes. Similar to the broader state, Chicago showed variability in commute times. Like the state as a whole, most commuters travel between 30-34 minutes to get to work. 20% of Chicago residents have a commute in this time range. The least common commute time was again 25-29 minutes. Only 6% of Chicagoans have this commute. 8% of residents had a commute between 10-14 minutes, while 17% of city dwellers commute an hour or more to work. Residents in Chicago saw less variability in the mean commute times than Illinoisans overall. The residents of 60603, which contains part of the Loop area, have a mean commute time of 20.3 minutes. On the other end of the spectrum, residents of 60619, which encompasses areas in the Chatham, Avalon Park, and Greater Grand Crossing neighborhoods, see a mean commute of 41.6 minutes. The time Illinois workers leave for work showed great variability. Only 14% of people left before 6:00 am. 20% of left between 6:00 am and 7:00 am. 26% of commuters left for work between 7:00 am and 8:00 am. 16% left between 8:00 am and 9:00 am. Finally, 24% of commuters left for work between 9:00 am and 11:59 pm. The time people leave for work can be based on a number of factors. Distance, traffic, and start times all have an impact on when people leave for their commute. For city residents in the City of Chicago, the breakdown in departure time varied only slightly from the overall state. 13% of commuters left between 12:00 am and 5:59 am. 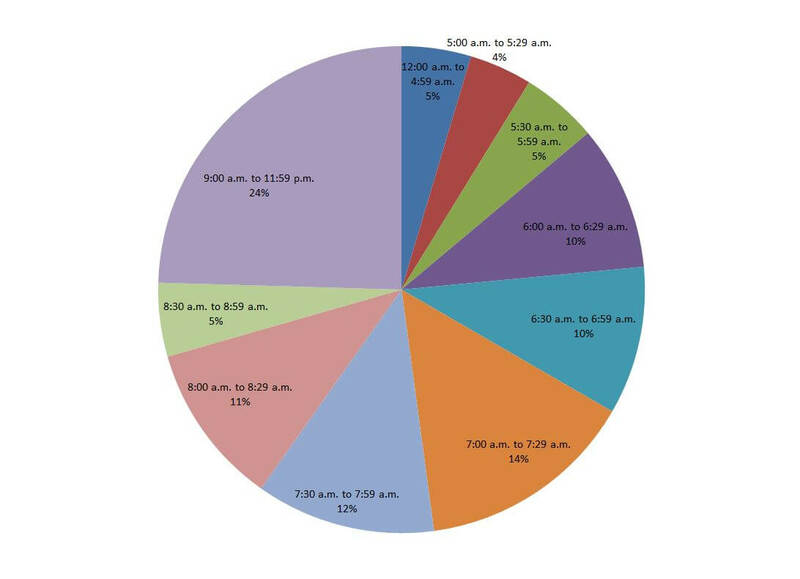 16% left between 6:00 am and 7:00 am, 24% of city residents left between 7:00 am and 8:00 am. 20% of commuters left home between 8:00 am and 9:00 am. Finally, 27% of Chicagoans left for work between 9:00 am and 11:59 am. Should You Move Before the Baby Comes?